It's October! I have an fashion essentials post today, with five of my favourite things to wear in Autumn. I hope this post gives you a little inspiration! Also recently I found an online site called Raise. They sell gift cards for discount prices and buy unwanted gift cards They have loads of different shops like Zara and H&M. It's super handy, I never knew anything like this existed. First is jumpers! Knitted jumpers and cardigans are just perfect to stay warm without the need of a winter coat. These are a few of my favourites. (Top to bottom) Green cardigan from Primark/Penneys // chunky jumper from New Look // light pink jumper from New Look // cropped lavender jumper from Missguided // black knitted jumper from Primark/Penneys. Next is socks! Fluffy, knitted, patterned and frilly socks to wear over tights and with boots are my favourite. They just make an outfit for me, even if you can only see the top sticking out of your boots. Some of them just scream "Cute!". All socks from Primark/Penneys apart from no. 4 which are New Look. Next in my list are boots. Boots are a perfect Autumn accessory. I have been loving ankle boots in particular. They go great with everything - dresses, jeans, skirts, etc. These first pair are from Penneys (Primark) which I bought last Winter. The second pair I wore pretty much all summer. I picked them up in a New Look sale back in the Spring for €22! I just adore them. The third pair are again from Penneys/Primark. They have a wedged heel and a suede type material. The slightly more formal of the three. Now for me, this bowler hat is essential. It's maroon, and maroon is my favourite Autumn colour, it just goes great with any outfit! Snood from Penneys/Primark // blue scarf is from New Look. These two were gift so I'm not sure where they are from but I love the designs. 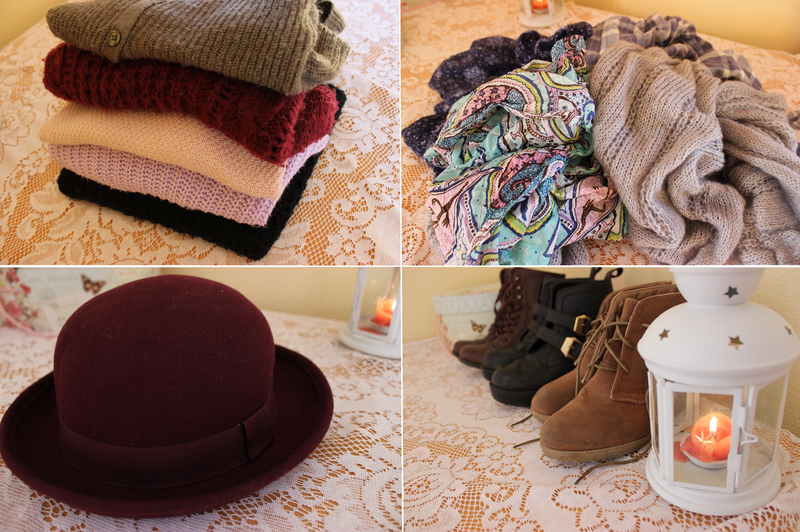 Thanks for reading and let me know your fashion essentials for Autumn! I love A/W fashion! Can't beat being super snuggly in cosy knitwear!